Zimbabwe's rogue president, Robert Mugabe, has finally exposed himself as being what many in the West and even in the rest of Africa have feared the worst about him. Not only is he a power-hungry dictator determined to stay in power at any cost, but he's also a blatant racist -- every bit as contemptuous of white people as the former apartheid regime in South Africa was of blacks. Mugabe, who has ruled Zimbabwe since independence in 1980, came out of the dictator's closet on Sunday when -- true to his vow that the opposition Movement for Democratic Change (MDC) would never govern in his lifetime -- he was sworn in for a sixth term as president, two days after a one-man runoff election denounced by African observers and much of the world as a sham caused by violence and intimidation by his ruling party against his opponents. The rapidly-convened ceremony was staged barely an hour after the country's electoral commission declared he won a total of 2,150,269 votes against 233,000 for opposition leader Morgan Tsvangirai, who boycotted the runoff but whose name still appeared on ballot papers. Turnout was announced at 42.37 percent -- a steep plunge from the more than 78 percent turnout in the March 29 general election that saw Tsvangirai's MDC take control of the Zimbawean parliament from Mugabe's Zimbabwe African National Union-Popular Front (ZANU-PF) party and Tsvangirai coming out on top in the presidential vote over Mugabe, but failing to avoid a runoff. More than 131,400 ballot papers were rejected in the highly controversial runoff, giving Mugabe more than 85 percent of the votes cast. The results were flatly rejected as illegitimate by observers from the 14-nation Southern African Development Community (SADC), who, in an uncharacteristically sharp rebuke, said the election "did not represent the will of the people." "The pre-election phase was characterized by politically-motivated violence, intimidation and displacements," Angolan Sports Minister Jose Marcos Barrica, the head of the 400-strong team of observers, said in a statement. It is indeed noteworthy that not a single African head of state attended Mugabe's swearing-in ceremony, in sharp contrast to his previous election victories. Mugabe -- who later flew to Egypt to attend an African Union summit in the Red Sea port of Sharm al-Sheik -- could for the first time face a cool, if not hostile, reception from other African leaders. At the end of their two-day summit -- which saw strong criticism of Mugabe by Botswana -- African Union leaders late Tuesday passed a resolution calling for a government of national unity and encouraged both sides to live up to pledges to start dialogue to promote stability. But the resolution was immediately rejected by both the Mugabe regime and the opposition MDC. Mugabe's spokesman, George Charamba, said Zimbabwe would not follow Kenya's example and create a unity government. "We have our own history of evolving dialogue and resolving political impasses the Zimbabwean way. The Zimbabwean way, not the Kenyan way," he told reporters. Meanwhile the MDC said Friday's one-man election had killed off any prospect of a negotiated settlement. Tendai Biti, the MDC's secretary-general who faces treason charges in Zimbabwe, said in Harare, the Zimbabwean capital, that the country's "sham election" last week "totally and completely exterminated any prospect of a negotiated settlement." Prime Minister Raila Odinga of Kenya, among Mugabe's most vocal critics on the continent -- and whose own rise to power earlier this year came about as a result of a power-sharing compromise with President Mwai Kibaki that ended weeks of violence following a disputed presidential election -- called on the African Union to send troops into Zimbabwe and labeled Mugabe "a shame to Africa." New York-based Human Rights Watch said on Sunday the African Union will lose credibility if it fails to isolate Mugabe. "African states should impose sanctions against Robert Mugabe and his illegitimate government in Zimbabwe after the sham presidential runoff," the organization said in a statement. In Washington, President Bush said Saturday the United States was working on ways to further punish Mugabe and his allies. That could mean steps against his government as well as additional restrictions on the travel and financial activities of Mugabe supporters. Bush also said he wants the United Nations Security Council to impose an arms embargo on Zimbabwe as well as travel bans on Zimbabwean government officials. The U.S. plans to introduce a resolution in the council this coming week, but China -- which has veto power -- declined to either support it or oppose it. For their part, Russia, which also has veto power, and South Africa, which doesn't, have said the situation is an internal matter. Chambara rejected criticism of the election, telling reporters that the West could "go hang a thousand times." President Thabo Mbeki of South Africa, the regionally-appointed mediator for Zimbabwe, has worked for a negotiated solution in the country but has seen his own stature sink rapidly as he faced calls by Tsvangirai for him to be removed from his mediation post over his policy of quiet diplomacy -- ironically, the very same policy that in the 1980s brought discredit to the United States in its dealings with South Africa's former apartheid regime. At his swearing-in ceremony, Mugabe lavished praise on Mbeki -- a deeply unpopular "lame duck" who has less than a year remaining in his tenure as president of South Africa and who already has lost control of his own ruling African National Congress party -- with Mugabe saying Zimbabwe was "indebted to his [Mbeki's] untiring efforts to promote harmony and peace." Meanwhile, Mbeki's predecessor, Nelson Mandela, in a stunning indictment of his old friend Mugabe, lamented at what he called " the tragic failure of leadership in our neighboring Zimbabwe." Speaking Wednesday in London at a lavish dinner celebrating his 90th birthday, Mandela's comment was as much a slap at Mbeki's quiet diplomacy as it was about Mugabe's dictatorship. Mugabe had declared opposition leader Morgan Tsvangirai a puppet of former colonial power Britain and of wealthy whites. In a comment that can only be interpreted as a racist diatribe, Mugabe vowed that Zimbabwe "shall not again come under the rule and control of the white man, direct or indirect. Never, ever"-- even vowing to plunge the country into an all-out civil war to stay in power had he lost Friday's run-off election. Yes, this blogger -- an African-American -- is saying it openly and clearly: Robert Mugabe is a racist. A black racist. Whereas other African freedom-fighters against European colonial rule and later white-minority rule in South Africa, Namibia and Zimbabwe were seeking self-determination for the black African peoples in those three countries, Mugabe was -- and remains -- driven by something else: A deep-seeded hatred of whites and of anyone else he perceived as aiding and abetting whites, such as Tsvangirai. 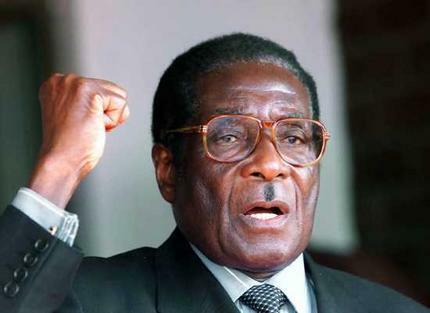 In that regard, Mugabe -- who in recent years has even sported a moustache eerily reminiscent of Adolf Hitler's -- has more in common with the racist white-minority regimes of Ian Smith in the former Rhodesia that Mugabe's ZANU-PF ousted from power in 1980 and of P.W. Botha in South Africa. Mugabe is as contemptuous of white people as Smith and Botha were of blacks. It is Mugabe's racist tunnel vision that colors everything he and his regime does and lies at the heart of his defiance of world opinion -- especially of the West. That Mugabe's attitude is shaped by his hatred toward whites has been made over and over again in his 28 years in power. He has frequently portrayed Tsvangirai as a puppet of former colonial power Britain and wealthy whites, thousands of whom lost their land when he launched a controversial program of farm expropriations at the turn of the decade. "Once again we want to make it clear to the British and Americans that we are no one's subjects and will never be," said Mugabe. "This country shall not again come under the rule and control of the white man, direct or indirect. Never, ever. The British rule has gone, gone forever. The white man is gone, never, ever will this country be ruled by a white man again." This blogger is not alone in branding Mugabe a racist. Other black critics of Mugabe have long accused him of having a racist attitude towards white people. John Sentamu, a Ugandan-born Anglican archbishop of York in Britain, calls Mugabe "the worst kind of racist dictator," for having "targeted the whites for their apparent riches." Almost thirty years after ending white-minority rule in the former Rhodesia, Mugabe now accuses Britain of "promoting white imperialism" and regularly accuses opposition figures to his government of being "allies of white imperialism." Mugabe has even cited white European influence as an excuse for his brutally violent campaign against homosexuals in Zimbabwe, accusing gay and lesbian Zimbabweans of being "afflicted with a white man's disease," arguing that prior to the British colonization of the former Rhodesia, Zimbabweans did not engage in homosexual acts. There can be no doubt by now that after 28 years in power, the 84-year-old Mugabe doesn't give a damn what anyone thinks about him -- not the international community, not his African neighbors, certainly not the opposition MDC, certainly not the majority of the Zimbabwean people -- who are suffering not only from brutal oppression from his dictatorship, but also from the near-total collapse of their country's economy -- nor even reformers within his own ZANU-PF party. "Only God can remove me from office!" Mugabe boldly declared at a ZANU-PF campaign rally prior to Friday's runoff. Oh, really? At 84 years of age, Mugabe -- who, incidentally, was raised a Roman Catholic -- would be wise to avoid invoking God. The Creator could remove the dictator from the scene at any time and a lot sooner than he thinks. Just ask Tim Russert. And even if God doesn't remove Mugabe any time soon, the international community could starve Mugabe out by imposing a total international economic, diplomatic, cultural and sports boycott of Zimbabwe -- similar to that imposed in the 1970s against South Africa. Imagine Zimbabwe's athletes banned from the Olympics, its diplomats ordered to go home, its products embargoed from foreign ports and foreign goods (other than vital food and medical supplies) embargoed from export to the beleaguered country? As far as this blogger is concerned, there is little difference between the Mugabe regime in Zimbabwe and the former apartheid regime in South Africa. The former is just as brutally racist as the latter. Just as it was a sustained international economic boycott that eventually brought an end to apartheid in South Africa, the time is now past due for the world to treat the Mugabe regime the same way.